Hitachi technology and the Japanese New Energy and Industrial Technology Development Organization (NEDO) managed to develop a technology allow 3.9Tbit per square inch , so this will paves the way for the creation of hard disk drives with a storage capacity of up to 24TB. More details will be presented next week at the 2010 Material Research Society Fall meeting in Boston, Massachusetts. Essentially, when you are recording on a magnetic material, bits (a collection of magnetized particles) are laid out end-to-end on disk platters. Storage capacity is generally increased by decreasing the size of the magnetic grains that make-up data bits. As the magnetic grains became smaller or arranged more efficiently, more data could then be stored on the disk. The Japanese researchers have developed an ultra-high density patterning technology based on a self-arranged phenomenon of polymer materials. 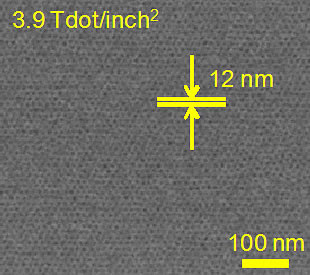 The materials allowed for the formation of accurate magnetic structures sized just 10nm. The technology, when applied to current density HDD (with areal density of about 500Gbits / square inch), will result to an 8-fold increase in the recording density. This means that we could see HDD with capacities of 24TB in the future.